No doubt about it, s’mores are the darling of Pinterest and the seeming showcase of many a winter wedding reception of the internets are to be believed. The little button nose completing the beauty that is the body desserts. But, if we’re all honest, when you really strip it down, s’mores are the worst. A real confectionary pain in the ying-yang, if you will. Let’s dissect it: you shove some marshmallows on a spear, toast said ‘mallows above open flame while simultaneously avoiding enrobing them in a crispy carcinogen coating, then try to get them off said spear, which is molten from the fire, and plunk them nicely on some cold chocolate, since you can’t spear Hershey’s blocks, and then eat it while avoiding spreading ‘mallow goo on your woven mittens. 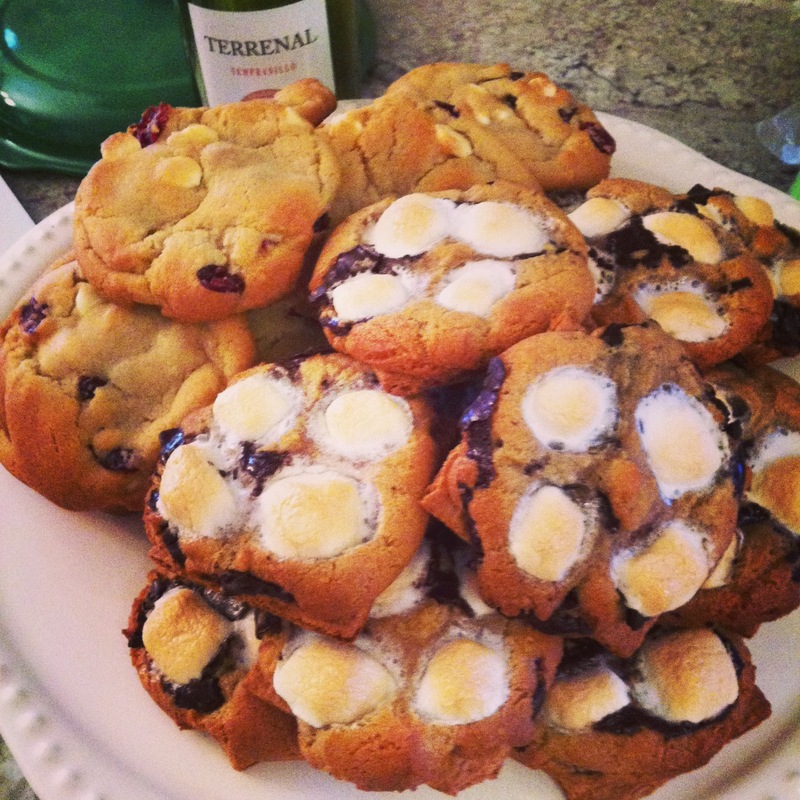 The IDEA of s’mores is great: marshmallow, graham crackers and chocolate. Nearly impossible to beat when you add in a crackling fire, chilly weather and the Pin-biquitous (Pinterest + ubiquitous. It’s a thing. I’m sure of it) Hunter wellies with a puffy-but-not-too-puffy puffer vest and big tartan plaid scarf, but really, no thanks. Instead, I choose cookies. No spears or self-deceit involved. Preaheat oven to 375. Cream butter-flavored Crisco and both sugars. Stir in eggs and vanilla. Combine dry ingredients and add to wet ingredients. On a cookie sheet, break graham crackers in half and arrange graham squares in rows on the cookie sheet. Spoon cookie dough onto center of each graham square. Bake for 4-5 minutes. Remove, and top each semi-baked cookie dough pile with 4 mini marshmallows. Replace in oven and bake 4-5 more minutes until cookies are baked and marshmallows are golden and toasted.